VANCOUVER, CANADA – Kaizen Discovery Inc. (TSXV: KZD) is pleased to report the results of the first field season at its 100%-owned Coppermine Project in Nunavut (see location map below). The Coppermine Project comprises a district-scale exploration target, covering approximately 3,500 square kilometres of Proterozoic sedimentary and volcanic rocks prospective for sediment-hosted stratiform copper, and high-grade volcanic-hosted copper-silver. 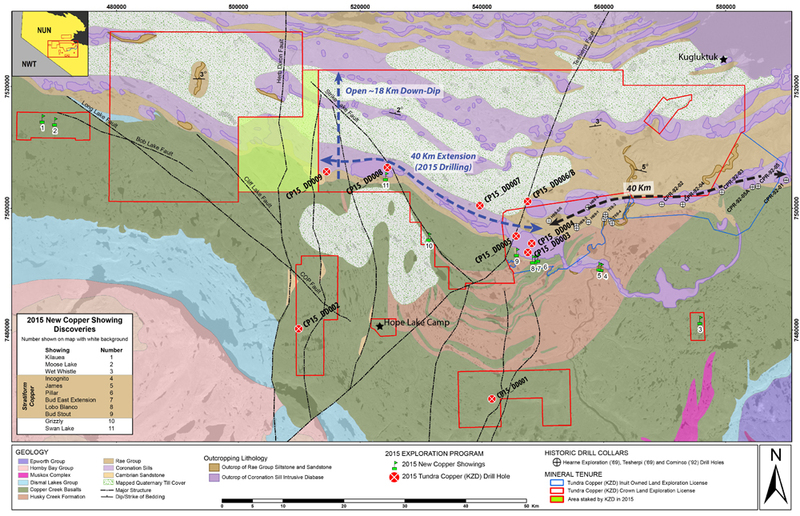 Following construction of a 20-person exploration camp adjacent to the Hope Lake air strip within the project area, and completion of archeological and wildlife surveys, Kaizen conducted regional prospecting and mapping and drilled nine diamond drill holes totalling 2,060 metres between July 18 and September 3, 2015. After completion of the program, the camp was winterized in anticipation of a follow-up drilling campaign in 2016. The majority of the program targeted sediment-hosted, stratiform copper-silver mineralization at the base of the Neoproterozoic Rae Group. The target is very gently north-dipping dark shale and siltstone overlying red beds and basalt of the Copper River Group, a setting analogous to important copper-producing districts such as the Central African Copperbelt, the Polish Kupferschiefer, and the Keweenaw district, Michigan. Previous work by Cominco in the early 1990s and Teshierpi Mines in the late 1960s intersected stratiform copper mineralization in a series of shallow drill holes over a strike distance of approximately 40 kilometres in the eastern part of Kaizen's licences. 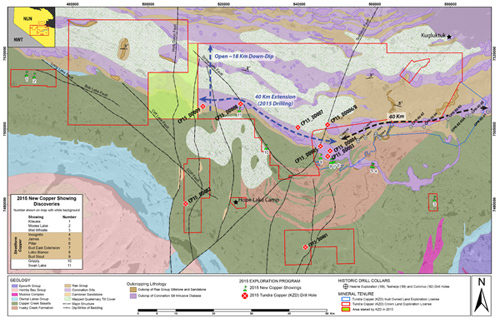 Kaizen's exploration plan for 2015 was to evaluate this historical work, conduct detailed stratigraphic mapping to develop a modern understanding of key elements of the sedimentary, stratigraphic and structural setting of mineralization, and to test the previously unexplored western extension of this mineralization at shallow depths, with widely spaced, reconnaissance drill holes. Kaizen's drilling program included seven regionally spaced, relatively shallow, vertical diamond drill holes through the base of the Rae Group, over a strike distance of approximately 40 kilometres westward from the historical drilling, and totalling 1,949 metres. Copper mineralization was intersected in all seven holes, and in most intersections consisted of disseminated copper sulphides (chalcocite, bornite and chalcopyrite). Results are reported in Table 1. The last holes of the program, CPR15-DD008 and DD009, stepped 17 and 27 kilometres westward, respectively. The final and furthest west hole, CP15-DD009, was collared above a north-south structural block within the underlying basalt-red bed sequence, and was characterized by significantly higher grade and width of mineralization than encountered in previous holes through the Rae Group. From 197.0 metres, hole DD009 returned 29 metres grading 0.57% copper (Cu), including a one-metre interval grading more than 3.04%, and a separate six-metre interval grading 1.06% Cu. The copper sulphides are disseminated, banded, replacive after interpreted former pyrite nodules, and in thin steeply dipping sulphide and sulphide-calcite veinlets. The copper sulphide species within this 29-metre intersection are vertically zoned from chalcocite at the base through bornite to uppermost chalcopyrite, with anomalous zinc values overlying the copper-rich zone - typical of zoning in stratiform copper deposits. Hole DD008 intersected anomalous zinc mineralization grading 0.18% over 3.11 metres, stratigraphically above a moderately mineralized copper zone (0.26% Cu over 5.06 metres). Zinc mineralization commonly is found laterally to copper in stratiform copper systems, and can be used to vector towards higher-grade copper in the central parts of such systems. Kaizen's 2015 drilling has doubled the confirmed strike length of mineralized basal Rae Group strata, from approximately 40 to 80 kilometres, and the system remains open along strike. To date, only the shallow, up-dip portion of the gently north-dipping target horizon has been tested along this 80-kilometre strike, and approximately 18 kilometres of down-dip extent remains untested on Kaizen's licences. The wide spacing of the 2015 reconnaissance drilling, in particular the western area with only two holes over a strike of approximately 30 kilometres, requires additional shallow drilling, targeting high grade areas. "We are encouraged with these initial results from the Coppermine Project," said Dr. David Broughton, Executive Vice President, Exploration. "Our program has greatly expanded the regional extent of copper mineralization within this underexplored district, and hole DD009 demonstrates the potential for significant copper grades. We expect to follow up these results during the next field season with a drilling program targeting shallow, higher-grade zones within the western area, and both down-dip and strike extensions of this system." As a result of the program, Kaizen has increased its land-holding over the Coppermine area by staking an additional 185 square kilometres in the western part of the licence area, covering a gap between its two main licence blocks (Figure 1). This western area that returned the most encouraging results is almost entirely covered, with virtually no outcrops of the targeted basal Rae Group sedimentary rocks. Added B. Matthew Hornor, President and CEO, "We are pleased with the successful conclusion of our initial program at Coppermine, and would like to express our gratitude for the support we received from local stakeholders, in particular in the Hamlet of Kugluktuk. We look forward to advancing the project with the participation of one or more Japanese partners." The first two holes of the program, CP15-DD001 and DD002, tested two volcanic-hosted showings within the Copper Creek basalts. 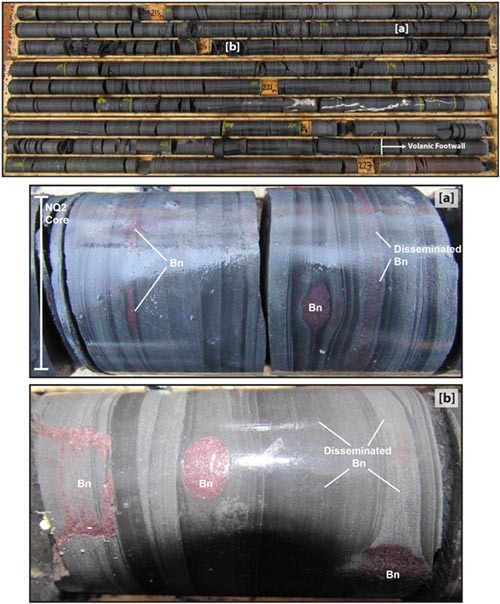 Copper mineralization was intersected in both holes (Table 1) but Kaizen subsequently focused its drilling on the sediment-hosted stratiform copper potential in the basal Rae Group. Table 1: Assay results for drill holes at Coppermine Project, July to September 2015. Note: Composites based on minimum 0.1% copper and 1 g/t silver. The true width of the drill intersections reported throughout this release is approximately equivalent to drilled width, based on the flat dip of the host rocks. Figure 1. Geological map of the Coppermine Project showing location of drill holes. Figure 2. Disseminated bornite (copper sulphide) within the basal Rae Group of drill hole CP15_DD009; boxes shown are from 214.60 to 227.32 metres. The technical information contained in this press release has been reviewed and approved by Scott Close, P.Geo, a Qualified Person as defined by National Instrument 43-101 and a registered member of NAPEG, Northwest Territories and Nunavut Association of Professional Engineers and Geoscientists. Mr. Close is not independent of Kaizen for purposes of NI 43-101. Kaizen Discovery maintains a comprehensive chain of custody and QA-QC program on assays from the Coppermine Project. As a matter of procedure, all drill core is cut at the camp using an electric-powered core saw, bagged and sealed for shipping to ALS Minerals preparatory lab in Yellowknife, N.T., followed by secure transport to and multi element assay at ALS's principle laboratory in North Vancouver, B.C. Analytical procedures consisted of 33 Element Four Acid ICP-AES, followed by automatic Ore Grade Four Acid ICP-AES for all copper over limits. In addition to the laboratory's quality control program, a rigorous on-site quality assurance and quality control program is implemented involving the insertion of blanks, standards and splits to ensure reliable assay results. Assay intervals above have been calculated with a 0.1% cut-off value. The 2015 drilling program and sampling protocol were verified by Scott Close, P.Geo, a geological consultant for Kaizen. Mr. Close has verified the data disclosed in this news release. Forward-looking statements may include, without limitation, statements regarding Kaizen's planned exploration program at Coppermine in 2016 and the participation of one or more Japanese partners in the project.